Twitch Prime lets you watch and play the best games. Much like parent company Amazon, Twitch is offering its Prime subscribers additional value for their dollar. 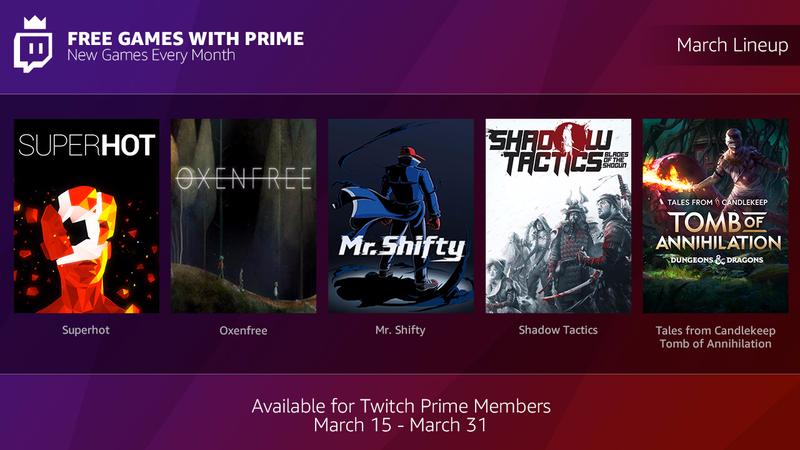 Not content with simply providing the best place to watch your favorite games, the streaming giant is now offering a monthly assortment of free games to members with Twitch Prime. The free game bonanza starts this Thursday, March 15 with 5 games that are free to keep for Twitch Prime members. Shadow Tactics and Tales from Candlekeep may look very familiar to Twitch members as they were winners in the Twitch Prime Indie Amplifier competition. Eventually, all eight titles from the competition will be made available via the Free Games with Prime promotion, so pay attention in the coming months. If you haven’t yet signed up for Twitch Prime, you can get all the details here. Twitch is becoming yet another place to collect game icons.